I added a rule today not to be a seller above 1197.
initial position was at 1180. I'm finally learning "campaign trading." Chaos Trading Made Easy homework. 2/11/2005 1:40:31 PM Mountain mjs:: Gotta sign out my better half is due ( from teaching all day) and we are scheduled to go to Gand Ma's tonight. Happy trading or Happy Trails depending on where you are. 2/11/2005 1:30:03 PM Mountain mjs:: Good thing we have Dr Al to keep us in reality. Otherwise we would be trading the sky today. 2/11/2005 12:37:00 PM Mountain wlj:: you are a good man mjs. 2/11/2005 12:11:00 PM Mountain mjs:: Here's a think about it blurb: we have make +9 or more pts today on on S&P contract that its $4500 in what 30 minutes. One of the things I do with my time besides being a consultant to Merrill Lynch and the U.S. Treasury Internatioanl banking is Missionary work for my church. In 1992 I raised $3.2million to help people in Latin America. For todays gain of $4500 per contract I can build 5 houses for families in Nicaragua (yea you can build a HOUSE ther for $800) now not a US house but something to imporove people's lives there. That is what I am doing with my winnings here. 2/11/2005 11:53:51 AM Mountain mjs:: Hey wlj you need more team spirit. How's about I introduce you to the Monkey Cheerleaders? 2/11/2005 11:51:13 AM Mountain mjs:: wlj monkey trader and I have been slugging through one after another small stp trade for a weeks in congestion. I know the key is these big trades to even out the odds. Pumped YES. It works so good it is (classified)(secret) etc. 2/11/2005 11:39:38 AM Mountain mjs:: After a Goal (from the 10 yd line mind you) the fight song is always playes (for you Brits that is Lord Nelson's words to shipmates "England Expects you to do your duty to God and Country) here it is: Yea Chaos! Go Green Go Red turn on the tides etc. etc. etc. 2/11/2005 11:22:15 AM Mountain TG:: My guess is bull flag and probably a 2:00 up move that comes late after a few down fakes. 1213-1215 late looks reasonable. 2/11/2005 11:22:13 AM Mountain mjs:: errata as they say in publishing: my e-signal is showing a early run to 1209+ before the open or at the open. what is this? was not there this morning. 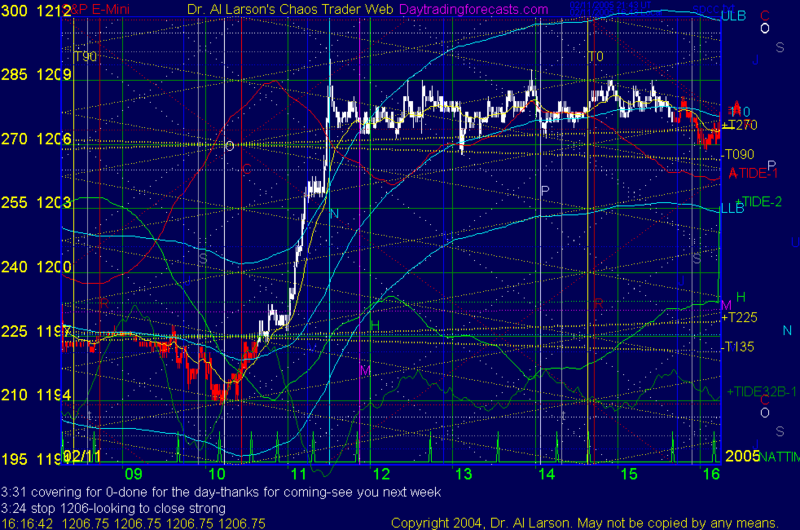 2/11/2005 11:13:53 AM Mountain mjs:: looking for set up for 1400. where is this dip going? 2/11/2005 10:18:40 AM Mountain MJS:: OK monkey decided to take the whole tree at 1207. See YA! 2/11/2005 9:54:23 AM Mountain MJS:: Now is there a way to speed up those planets so we can do this again on Monday??? 2/11/2005 9:51:12 AM Mountain wlj:: my news service has C B S reporting the reason for the rally was dan rather reporting you can turn water in to gasoline, he has the paper work to prove it. 2/11/2005 9:40:57 AM Mountain MJS:: NOW DR AL I will never be able to get the Monkey oout of the tree. still in and moving up stps. 2/11/2005 9:36:59 AM Mountain TG:: Amazing how that started at C and continued to N.
2/11/2005 9:34:18 AM Mountain TG:: Dr. Al, you helped me make my best day trade I've ever pulled off. In at 1197.25 out at 1209 on that one, largest amount of contracts I ever trade. Thank you very much!! 2/11/2005 8:10:43 AM Mountain wlj:: mjs, when you get to texas don't forget to buy the monkey a cowboy hat. you don't want him to look out of place.